Images of half-sunken yachts and wreckages emerged this morning showing the scale of the damage. Image courtesy of AP. 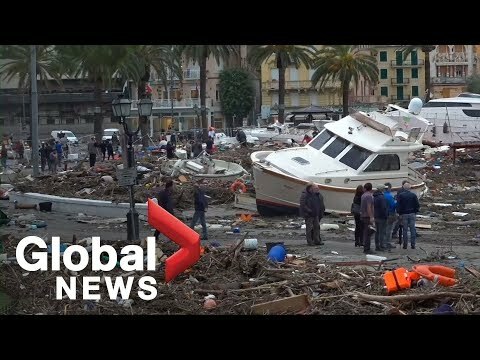 Hundreds of yachts have been damaged after a storm caused chaos in Northern Italy yesterday (Tuesday October 30). Heavy rain, high winds and waves up to 10 metres high battered the coastline overnight, causing many yachts to break away from their berths and leaving millions of pounds worth in damage. 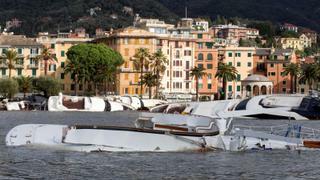 Carlo Riva Marina in Rapallo, which can host yachts up to 50 metres, was badly affected by the storm and saw half of the near-400 yachts in the marina destroyed by the waves. Marina director Marina Scarpino told Italian news agency ANSA, "Ten-metre-high waves struck the rocks for hours and their force broke the storm barrier for 300 metres. After a collapse in 2000, because of another freak wave, we had rebuilt the dam higher by 1.3 metres taking it up to 6.5 metres. But it was not enough with this exceptional event." Images of half-sunken yachts and wreckages emerged this morning showing the scale of the damage. One video shows 37 metre Custom Line Suegno semi-submerged outside the port's walls. At least 11 people have died as a result of the storm with thousands more displaced or left without power. Flooding also caused major disruption in the Veneto region, in particular Venice which is currently 70% underwater.